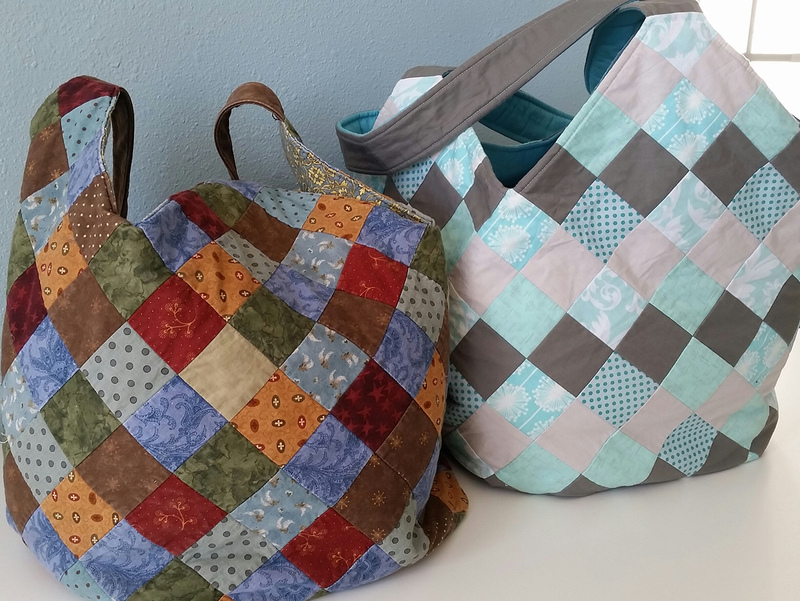 The mondo bag is a fun patchwork bag that is pieced on a grid foundation. In this class you will learn the method of grid foundation piecing. It looks difficult but is very easy! The rest of the bag is constructed with basic sewing techniques. By the end of class you should have a completed bag to take home. This bag is jelly roll friendly. You will need about 15 2 ½ inch strips to complete the outside of the bag and handle. If you don’t have a jelly roll then yardage to get those 15 strips is just fine. You can have as many or as few colors as you choose. You also need 1 ¼ yd cotton fabric for the lining and 1 ¼ yard fusible fleece. Fusible fleece is a Pellon product that has iron on glue on one side and is about the thickness of thin cotton batting. This can be purchased at any fabric store or even Walmart. If you would like to cut ahead you need a total of 208 2 ½ inch squares. How many of each color would depend on how many fabrics you are choosing.